Isandhlwana, Rorke's Drift. 1879-01-22 : Six companies of the 24th Regiment were annihilated at Isandhlwana. Following this defeat British regiments no longer carry colours in the field. Can anyone tell me more about this battle? Did the carrying of colours contribute to the defeat, or was this just the final straw that made the army prohibit risking the regiments' most prized (but tactically useless) possessions? Someone else earlier on posted that in 1859 the British colours were made smaller and not carried to the front as before in battle. At Isandlwhana, the British were encamped in an unlaagered formation. The Colours, as near as I can place them were near Col. Pulleine's HQ at the start. Pulleine gave the Colours to Lt. Melville. The Colours were swept away - and I have heard they were recovered some time later. The Zulu War of 1879 forced the British Army to reconsider carrying Colours in battle. When the Zululand invasion force was annihilated at Isandhlwana on 22 Jan. 1879, two officers of the 24th Foot fled the battlefield with the Queen's Colour. Zulus pursued them and killed them in the Buffalo River where they lost the Colour in the river current. A search party later found their bodies and the Queen's Colour further downstream. When the regiment returned home in 1880 Q. Victoria asked to see the recovered Colour and placed a wreath of immortelles on the pike. The wreath is carried to this day, and that particular Colour, presented in 1866, was carried until 1934. In August 1880 an MP questioned the propriety of carrying Colours on the battlefield and recommended discontinuing "such impedimenta". The Secretary of War polled generals and colonels on the matter in July 1881. Finally in January 1882 the Army issued an order that "in consequence of the altered formation of attack and the extended range of fire, Regimental Colours shall not in future be taken with the battalions on active service." But at the same time they decided to retain Colours for ceremonial purposes, "affording a record of the services of the regiment and furnishing to the young soldier a history of its gallant deeds." This order extended to the Dominions and Colonies. 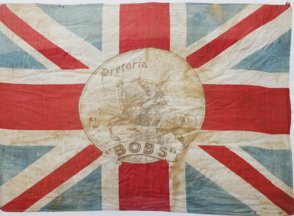 While the debate was in progress, the 58th Northamptonhire Regiment carried their Colours into action at the battle of Laings Nek during the 1st Anglo-Boer War (28 Jan. 1881). 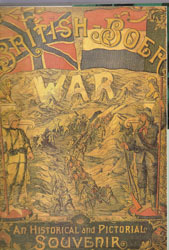 The Colours provided a conspicuous target for the Boer snipers, and Lt. Baillie carrying the Regimental Colour was repeatedly wounded before being killed. This was the last time British Colours were carried in battle. The Queen's Colour which was carried off the field at Isandhlwana was cased. Nobody had an opportunity to uncase the Colours during the battle. All the British (600) and over 2000 Zulus were killed at Isandhlwana. The Colours played no role at the battle (i.e. nobody was killed because they were a conspicuous target), but the press attention to the heroics of Lts. Melvill and Coghill who attempted to save the Queen's Colour, and the Queen's desire to see it afterwards are what raised the debate about the propriety of carrying Colours in modern warfare. In the Aug 2000 National Geographic Magazine shows a flag in a photo where British are fighting against the Zulus. There are other Zulu flags? What are they? It is the Victorian fantasy painting by C.E. Fripp of the annihilation of the British force at Isandhlwana on 22 Jan. 1879. The flag, for what it's worth and what you can see of it, is an accurate representation of the Regimental Colour of the 2nd Battalion, 24th Regiment of Foot. The problem is, the Colour was not there. The Zulus clearly had no national or regimental colors. Each warrior carried a huge flag which was made of carefully matched bull hide, with the hair exposed. Thus all the warriors of the same regiment carried an identifying set. With bulls having only black, red, dun or white hair, the differences between regiments had to be effected with the pattern. There were monocolour shields, shields with large patches, speckled shields, etc. In the early days of the Zulu kingdom it was said that regiments could be quite efficiently distinguished from a distance by their shields. In some ways it is, for flags prior to that time and back to the ancient Chinese were for command and control purposes in battle. Since the Zulus had no flag, if the commander of their corps wanted to exert command and control over a particular unit he would have to know their shield facings to do so. In Tabatha Jackson's excellent and vividly illustrated book "The Boer War" there is a picture featuring 2 of the flags used in the conflict between Boer and British between 1899-1902. The Union flag is, of course, incorrect as the colours of St Andrew and St George are interchanged, but the ZAR flag depicted is most probably correct. It is from a non-vexillological source so I won't say any more as it most probably should not be on the Bibliography section. This Union Jack (26.5" x 19") from the Anglo-Boer War was on eBay recently. It features "Bobs" pointing his sword to Pretoria. The popular consensus was that once the capital of the Boers fell, they would be finished. Pretoria fell and Bobs came home, leaving Kitchener to do the "clean up." Above in an artistic flight of fancy, home-based war artists are always behind the times about what's really going on the battlefield. Bobs wields a sword in a most un-Boer War like manner. "There they are lads; Go get em." It was enough to make any red-blooded Englishman burst their britches with, well, pride... (Anglo Boer War Museum).